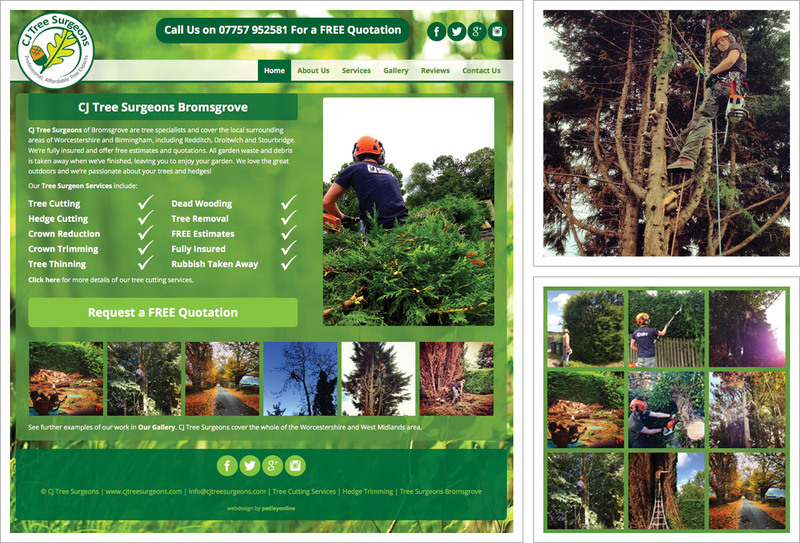 A new responsive / mobile friendly website for Bromsgrove based CJ Tree Surgeons. CJ Tree Surgeons are professional tree surgeons operating in Bromsgrove, Redditch, Droitwich and the surrounding Worcestershire area. Business owner James was introduced to Pedleyonline by one of our existing customers. The website project brief was to develop a new website with an improved search engine ranking position on Google. Other considerations were the website’s ability to convert visitors to customers, making it more on-message, easy to use with intuitive navigation regardless of the device being used to access the site. The new site has a horizontal navigation menu, widescreen background image, Lightbox image gallery. All content adjusts when viewed on a mobile phone or tablet. The new website design looks great, is easy to use and contains all of the information you need if you need to get a tree chopped but don’t want to get your hands dirty. A lightbox image gallery of tree-chopping action, customer reviews and links to social media, Facebook, Twitter, Instagram, Google+ all show this to be a very active, enthusiastic and service driven local business.